You may be asking yourself if the business card is still relevant and the answer is yes. The business card has earned itself a bad reputation. They’re now known to be boring and usually thrown away or lost immediately upon being received. In most cases, this is true. Business cards are usually extremely boring and since they contain information that can be put into a cell phone and then disposed of, the chances they’re thrown away are pretty high. If you learn how to utilize the business card to your advantage, you can drive more traffic to your business then you may have imagined. Yes, the business card can be useful. In fact, if it’s packed with information, then it can be deemed necessary by many customers. Some ideal business cards can include items like a QR code. This can link to a discount or coupon that a customer will most likely want to save and use later. If you only include your name and email on the card along with the QR code, which can be used to retrieve more information, such as phone number and address. This way, there is a reason to keep the card aside from entering your information into another device. With the world of technology constantly growing, you could make your business card 3D. That may not be ideal for many wallets, but it’s an option to spice things up a bit. Get creative with your card! Regardless of what kind of business you’re in, there is absolutely no reason that your business card has to be on a boring piece of stock card. If you’re a butcher, splatter red ink all over your card. If you own a bakery, glue some sprinkles on your business cards or even go into left field and make the card edible. There are many options for creativity when it comes to making a unique and memorable business card – take an idea and run with it. Simplicity can be as effective and just as creative, if you prefer to keep it light. 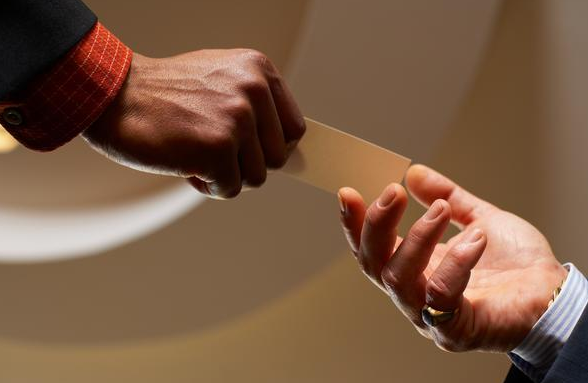 Imprinting your information or using a heat-activated marker, so when the card is touched your information is displayed, is a simple, yet creative idea for business cards. Making a memorable business card is another form of marketing. Despite how creative and unique your card is, it is probably going to be thrown away at some point – but once you create a memory, there is no turning back. People aren’t going to forget a blood spattered business card or one they were able to eat. They are going to remember what your business was and why they enjoyed it in the first place. If for some reason they forget to save your contact information, they will definitely remember the name of your business. This can also create a buzz online; people like creativity and they really like discussing it via social media. If something catches the attention of one person, once it hits the web it will go viral faster than you think. Business cards may have earned themselves a bad reputation, but they certainly aren’t dead – they are alive and well. To get more information for startup founders and entrepreneurs that you won’t find elsewhere, sign up for your FREE SUBSCRIPTION to Successful Startup 101!